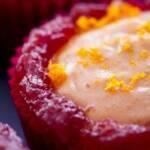 These cranberry orange cupcakes give off a wonderful aroma. They will call your guests to eat them. 1/4 C jellied cranberry sauce This is the kind that you may be subjected to on Turkey day that isn't nearly as good as the homemade stuff, but somehow works on a cupcake. You'll use up the rest of the can if you pipe the ring of cranberry like I did. A few hours before you are ready to bake, combine the orange zest and the sugar in a bowl. This will let the orange flavor infuse into the sugar. While you are waiting, prepare an orange syrup by bringing the orange juice concentrate and sugar to a boil in a saucepan. Stir continuously until it is thoroughly combined and gets slightly thicker (about 10 minutes). Remove from heat and return to room temperature. Beat butter and the sugar with grated orange zest in a large bowl for 1 minute, until light and fluffy. Beat in eggs and yogurt until blended. Alternately fold in flour mixture and 2/3 cup of the orange syrup (that should be pretty much all of the syrup) in three additions, beginning and ending with flour. Fold in the Cranberry Orange Tango or nuts and dried cranberries. Add the cranberry sauce and brown sugar. Bring to a boil and lower heat to medium low and continue to boil for 2 minutes, stirring constantly. Add the milk and bring to a boil, stirring constantly. Gradually add sifted powdered sugar. I would highly recommend sifting this powdered sugar. It's such a pain to sift, but it ensures that the frosting will be extra smooth. Beat until thick enough to spread. If too thick, add a little hot water. Spread the frosting onto the cupcakes and let it harden just a bit. Then, pipe a ring of cranberry sauce around the edge of the cupcake and sprinkle on some orange zest for some added color. *The cranberry brown sugar frosting recipe did not taste very cranberry-esque, but it was the perfect compliment to the cupcake.